In the United States, government agencies like the FCC have launched open government websites in beta. In the United Kingdom, the United Kingdom is rolling back one more version and seeking alpha. In either sense, a government seeking alpha in rebooting its online presence is both taking risks and revisiting what government websites should do in the 21st century. The trial of Alpha.gov.uk offers a toolkit of simple, reusable functions that are oriented around the most common needs that citizens go online to address, like lost passports. This isn’t the first time that the government has experimented with creating a single site for all departments. From URL directories to public service hubs, sites like direct.gov.uk have often tried to shove the whole shebang into one, hulking site with varying degrees of success. 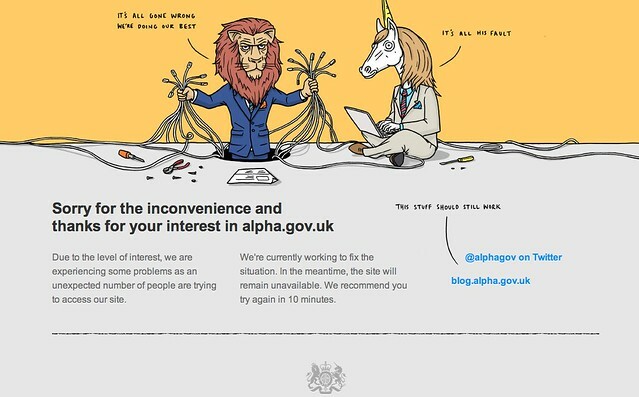 But Alpha.gov.uk’s daring design, 21st century architecture and expansive ambitions (the content can be easily syndicated to new internet platforms, like apps or IPTV), could be the way forward. The Alpha.gov team continues to share more about how Alpha.gov was developed at the project blog, encouraging citizens to play with the prototype and send feedback to Get Satisfaction or to @AlphaGov on Twitter or Facebook.